Crunchy, refreshing, colorful, exploding with flavor, and packed with protein? 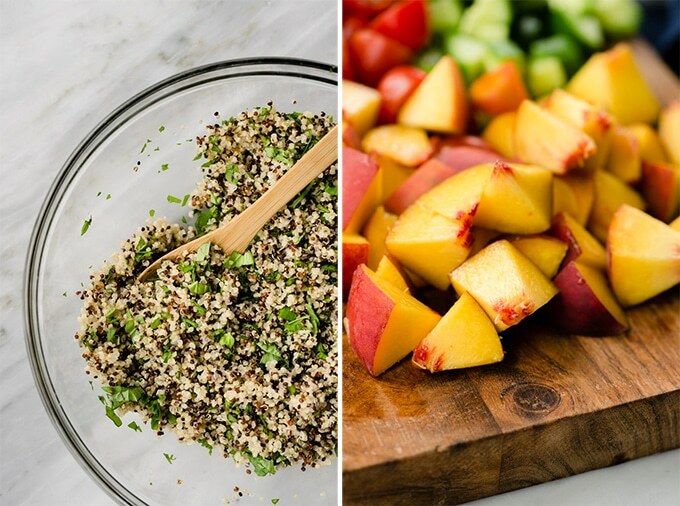 Yep – that about sums up this summer quinoa salad! Y’all asked me what else you can do with my sunbutter sauce, and I’m more than happy to deliver this delicious answer. 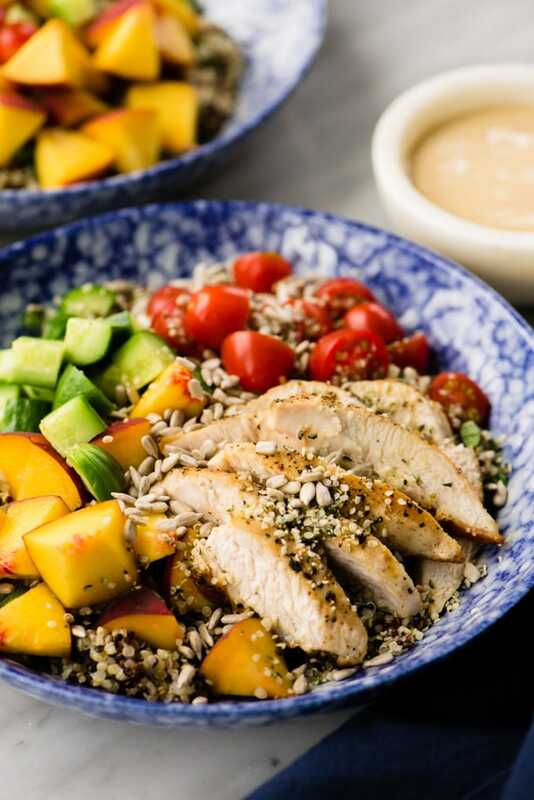 It pairs perfectly with grilled chicken and sweet summer peaches, and the end result is a gluten free, dairy free, nut free summer salad that tastes anything but healthy. Happy Tuesday! 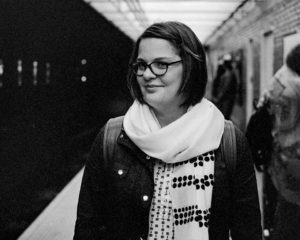 This is an “asked and answered” post – my very favorite kind. The kind where readers ask me questions and I get to deliver an answer in epic fashion. Back in the spring I posted this recipe for broccoli and cauliflower salad with sunbutter sauce and y’all went nuts for it (even though it’s nut free). And with good reason. Not because it’s chock full of veggies and the perfect picnic or prep meal. Oh, no no no. It’s because that sunbutter sauce is seriously to-die-for delicious. And I fully agree with your assessment – that sauce is boss. 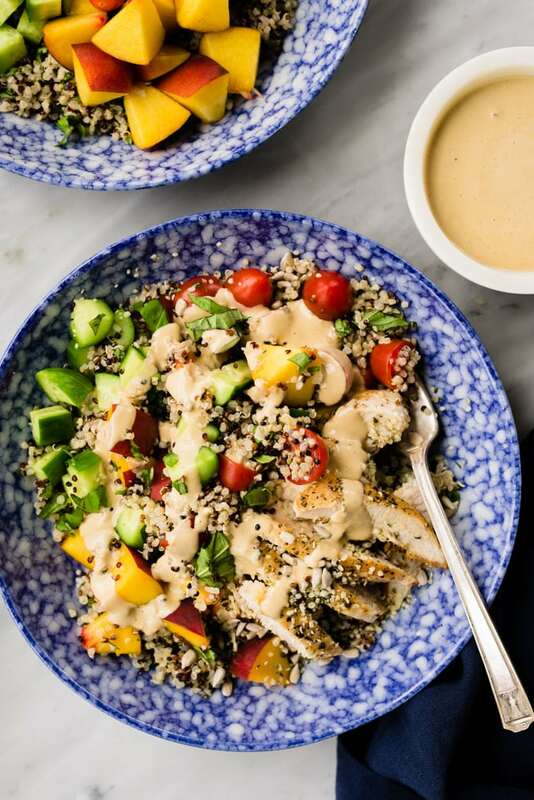 A few readers have asked what else they can slap that sauce onto and I’m here today to tell you that this summer quinoa salad is the answer. It’s crunchy. It’s sweet. It’s tangy. It’s gluten free, dairy free and of course nut free, and hands down the easiest and most delicious summer lunch or dinner you can get your greedy hands on. And if that wasn’t enough, it’s got a whopping 40g of protein to keep you happy and satisfied straight through to your next meal. There’s a whole lotta goodness in that bowl. So thank you, awesome readers, for pushing me to come up with more reasons to soak up sunbutter sauce. This version just might be better than the first, but I’ll let you decide. Pin it now! Click here to save this summer quinoa salad to your gluten free recipes board on pinterest. 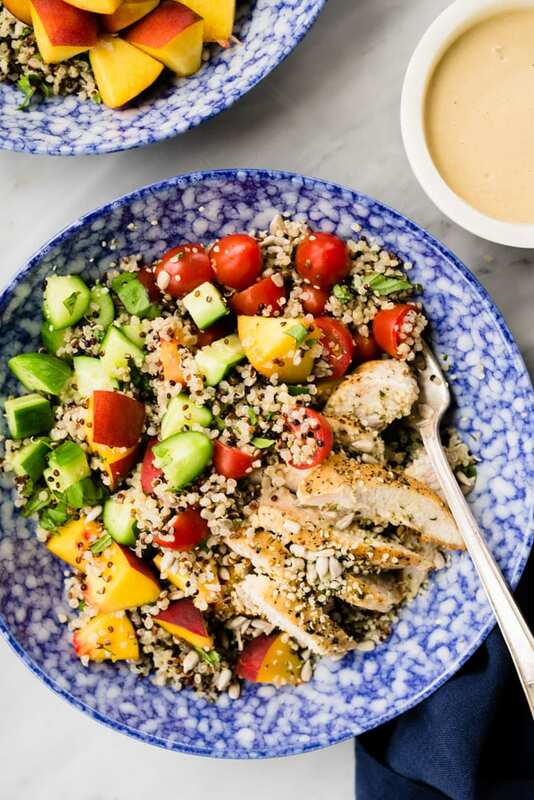 This summer quinoa salad is super duper easy and comes together in less than 30 minutes. Have it for dinner, or pack into meal prep containers for lunch. Just do it, that’s all I ask. Make up a batch of quinoa, and then toss it with a big handful of chopped basil. I used about half a cup – don’t skimp. Then dice up some seasonal fruits and veggies. Many many fruits and veggies will work here, but this combo of peaches, tomatoes, and cucumbers was the perfect balance of crunchy, colorful, and sweet. Throw is some avocado for extra fat, swap the peaches for other stone fruits, toss in a handful of shaved carrots or cabbage. It all works. 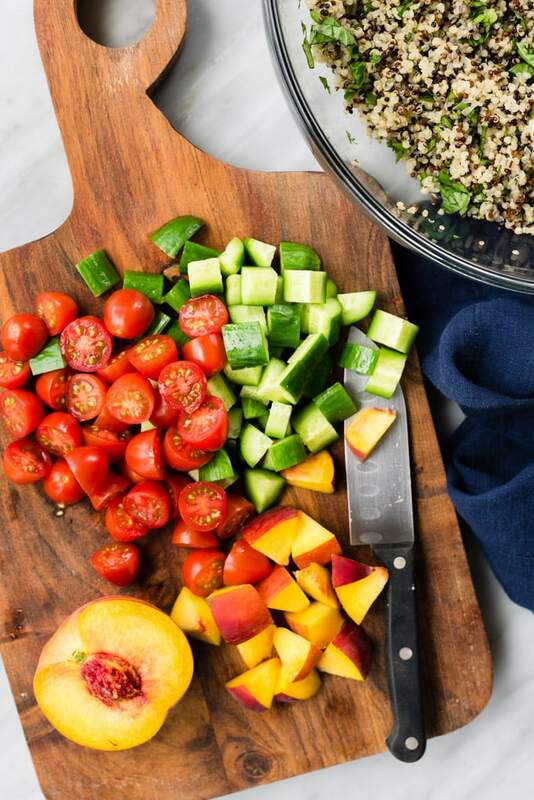 Place the herbed quinoa into a bowl, then top with diced peaches, tomatoes and cucumbers. Slap on some grilled chicken. Swap the chicken for chick peas if you’re not into chicken. It’s okay – I won’t tell. Add some hemp seeds for another layer of protein, and sunflower seeds for crunch. Drizzle with sunbutter sauce and then shove it into your face and feel awesome. Pat yourself on the back for whipping together a healthy but seriously delicious summer salad in less time than it takes for take-out. Go you! 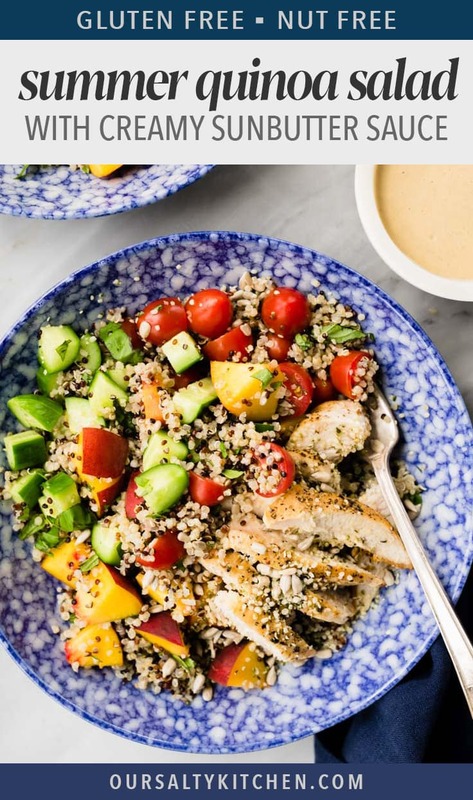 DID YOU MAKE THIS SUMMER QUINOA SALAD? I WANT TO SEE YOUR CREATIONS! SNAP A PICTURE AND SHARE IT HERE ON PINTEREST. 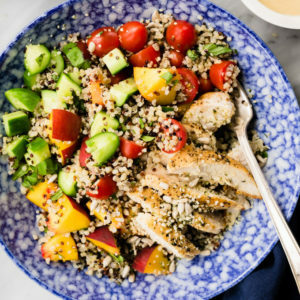 This crunchy and refreshing quinoa salad is the perfect summer lunch or dinner. It's gluten free and dairy free, but packed with tons of flavor and protein! Place the quinoa into a fine mesh sieve and rinse under cool running water. Place the rinsed quinoa into a small pot and add 2 cups of water or broth, plus a pinch of salt. Heat over high heat until the water comes to a boil. Reduce heat to medium low, cover, and cook until the quinoa has absorbed all the water, about 15 minutes. Toss the cooked quinoa with the chopped basil leaves. While the quinoa is cooking, grill the chicken. Place a grill pan over high heat. Rub the chicken thighs with the olive oil, then sprinkle each side with salt and pepper. Grill 6-7 minutes per side, or until an instant read thermometer reaches 165* in the thickest part of the chicken. Allow the chicken to rest for 5 minutes while you chop the vegetables, then slice against the grain into 1/2" slices. Place 1/4 of the cooked quinoa into a salad bowl. Top with 1/4 of the tomatoes, peaches, and cucumbers, then 1/4 of the grilled chicken. 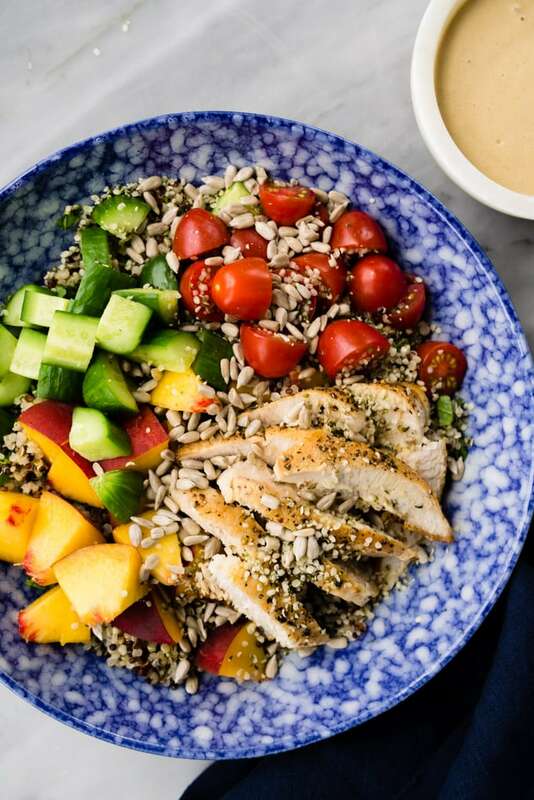 Sprinkle the salad with a tablespoon each of sunflower seeds and hemp seeds, then drizzle with 2 tbsp sunbutter sauce. Serve immediately. If you're making the sunbutter sauce from scratch, you'll only need about half the recipe. Save the other half and use it as a dipping sauce for fresh cut vegetables (or a second round of salads!). It keeps in the fridge for at least 2 weeks. I went off recipe, as I am wont to do, and swapped sunbutter for peanut butter in a sauce with rice vinegar, sesame oil, tamari, and garlic. IT WAS SUPERB. Why I have never done this before, I’m not sure. Regardless, nutfree swap for the win! Oh, and this salad is delightful. Peach and tomato is my other new favorite combo.